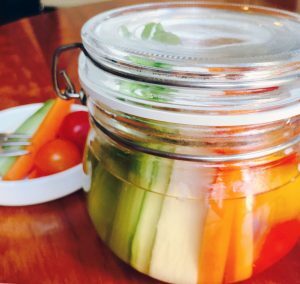 Pickling is one of the oldest methods of food preservation but did you know that your gut actually loves pickled vegetables because they are a source of healthy bacteria? The benefits of pickles include a good supply of probiotics, antioxidants, essential vitamins and minerals, and improves your digestion. Here, we let you in on how to make yourself a healthy pickled snack or side dish with Choya Umeshu! Cut the vegetables as high as the height of the jar that you’ll be using. Put the choya umeshu and vinegar into the pan and heat up just before boiling point. Turn off the fire and add some honey. Pour the mixture into the jar of vegetables and add a bit of white pepper, cardoon and fennel.